The microgrid, a nerdy tool for managing energy, has suddenly become the subject of hope and political intrigue in Puerto Rico. With people starting to demonstrate in the streets after more than two months of blackouts, influential groups both on the island and the mainland have seized on the flexible, free-standing microgrid as a way to bypass the broken grid. "Here we are, sadly, in a position where Puerto Rico is as close to a blank slate as we ever thought realistically would come to pass," Julia Hamm said during a visit yesterday to San Juan. Hamm is the president of the Smart Electric Power Alliance, one of several U.S. consortia that are becoming part of Puerto Rico's energy debate. Before that slate can be filled in, someone needs to establish the rules by which microgrids are built and paid for. That comes down to a battle for control between the island's utility and its energy commission, unless they're trumped by officials in Washington, D.C. Meanwhile, a broad slice of mainland interests — utilities, environmental advocates, the state of New York and big companies from International Business Machines Corp. to NRG Energy Inc. — are poised on the sidelines with a pent-up desire to either aid the island or make some money. The one thing everyone agrees on is that microgrids in Puerto Rico are a good idea. The Department of Energy defines a microgrid as "a local energy grid with control capability, which means it can disconnect from the traditional grid and operate autonomously." Microgrids got a burst of attention and federal funding after Superstorm Sandy in 2012 cut electricity to much of the U.S. Northeast. They are a compelling solution for areas prone to blackouts. Most microgrid advocates describe a local low-carbon power source, such as solar panels, coupled with a battery and maybe a backup diesel generator. With the help of a controller, it can either supplement power from the larger grid or "island" itself for a period of time. There are currently more than 3,000 megawatts of microgrids in the United States, mostly powered by fossil fuels, according to a report last month by GTM Research. It expects the size of the microgrid market to double, to $2.8 billion annually, within five years. With the disaster in Puerto Rico, microgrids have returned to the spotlight. The difference is that in Puerto Rico, the case in favor of them is even stronger. After Sandy, many people had power restored in days, and most were reconnected after three weeks. In Puerto Rico, the blackout continues after 10 weeks with no relief in sight, on an island with sky-high electricity prices and under a utility that appears hopelessly unable to right itself. The debate over microgrids comes amid growing impatience over the state of the recovery. In mid-October, Gov. Ricardo Rosselló promised that the island would achieve an 80 percent recovery of electric service by Dec. 1 and a 95 percent recovery by Dec. 15. As of yesterday, it was just over 68 percent. Early in the day yesterday, that number temporarily plunged by 10 percent when one of the biggest power plants, the Aguirre facility in the island's south, kicked offline in the middle of the night. In the last few days, residents of neighborhoods still in a state of blackout have marched on the offices of the Puerto Rico Electric Power Authority (PREPA) in the southwestern city of Yauco and in the capital. 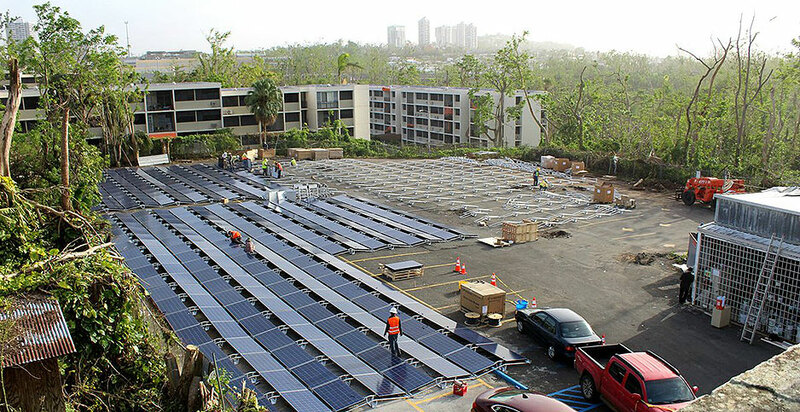 Even before the storm, the concept of microgrids was widely popular on the island, supported by the governor, PREPA and the Puerto Rico Energy Commission. But the floodgates opened in October when the energy commission started a new proceeding, asking the world for suggestions about how to recover from the hurricane with distributed energy resources and microgrids. It is working, at least by energy commission standards, at warp speed; the commission wants to establish minimum operating and financial rules for microgrids by the beginning of January or even earlier, the commission's acting president, José Román Morales, said in an interview. "Right now we are in an emergency, so we need to make sure the framework is place," said Morales, who, like many in San Juan, is bedeviled by a lack of electricity. With no working elevator, he climbs 21 flights of stairs to his apartment. The commission received dozens of replies, with a breadth that reveals how many have seized upon the idea. Big energy and information technology companies threw their hats in the ring, including IBM, Schneider Electric SE, NRG Energy and AES Corp., which already operates both a large coal plant and a small solar farm on the island. Its solution is a "mini grid" that, under normal conditions, would deliver electricity at half the price that PREPA can (the utility has some of the highest rates in the country) and during emergencies would power critical buildings. "We envision these mini-grids could range in size from a few MW's to one serving all of San Juan," AES's statement said. One company notable in its absence from the commission's comments is Tesla Inc. The company has been busy in Puerto Rico, building a small microgrid — solar panels plus batteries — to power a children's hospital in San Juan, and at crucial buildings on the outlying islands of Vieques and Culebra. But it appears not to be participating in the policy debate. Other responses came from the Sierra Club and Enlace Latino de Acción Climática (ELAC), which gave a detailed explanation of how microgrids could serve rural areas that have yet to see a flicker of electricity. Puerto Rico's grid is being rebuilt by the Army Corps of Engineers exactly the way it was, which "will leave many small, isolated and rural communities without power for long periods of time," ELAC's paper said. It believes that those towns could get power more quickly and cheaply, and that it "could be done at the same time as grid reconstruction, coming in from isolated and rural communities toward larger communities and eventually meeting the grid reconstruction effort in the middle." New York, which has more residents of Puerto Rican origin than any other state, is playing a lead role. Its governor, Andrew Cuomo, formed a coalition called the Puerto Rico Energy Resiliency Working Group that includes the New York Power Authority and some of the state's biggest utilities, as well as the Electric Power Research Institute, Southern California Edison and the Department of Energy, which itself is doing a deep dive into the island's potential for microgrids. Then there's the New York State Smart Grid Consortium, made up of many of the New York players above, as well as the New York Energy Research and Development Authority, Brookhaven National Laboratory and the New York Independent System Operator. The consortium has offered its services to Puerto Rico for free. Microgrids are part of a larger conflict playing out among PREPA, the energy commission and the governor over who controls the island's energy system. The prospect of microgrids could undermine PREPA's monopoly on electric service, especially if the commission's new rules open the system to new owners and outside investment. "This is the beginning of the end for PREPA," said Ramón Luis Nieves, a staunch opponent of the utility who, as a former state senator, wrote the law that created the energy commission. He's now in private practice, but his office is still unusable because the computers and air conditioning are dead. The energy commission and PREPA are two players that both have exceptional strengths and weaknesses. Unlike on the U.S. mainland, where most electricity regulators have existed for decades, the Puerto Rico Energy Commission was established only in 2014. It has repeatedly clashed with PREPA, which has operated essentially without oversight for decades (Energywire, Oct. 13). The commission has the legal authority to regulate PREPA, but since its creation, both the governorship and the territorial Senate have shifted to the opposing party. The commission has three members, but since its president resigned in April, Rosselló has left the seat vacant. Meanwhile, PREPA is one of the most powerful political forces on the island, and its electric workers union, the Unión de Trabajadores de la Industria Eléctrica y Riego, is one of the territory's most powerful unions. Both are strongly against removing control from PREPA, because doing so is likely to reduce both its influence and its workforce. And since the governor can appoint both PREPA's board and its top officials, it is a top source of political patronage. However, in the wake of the hurricane, most on the island have come to view it as incompetent. In its proceeding, under a heading titled "Use of Stranded PREPA Equipment," the commission asked how microgrids could use equipment that PREPA isn't using, and how PREPA could be paid for that use. PREPA, for its part, has continued to resist energy commission oversight. In response to another commission order, which required PREPA to submit extensive details of its purchases, the utility wrote that it "will place immense demands on PREPA and its personnel at a time when they and the people can ill afford a loss of dedication to restoration and safety." Meanwhile, it is unclear what effect machinations in Washington will have on the island's microgrid struggle. A meeting among key players will take place Wednesday. The "stakeholders only" meeting is intended to accelerate planning for new investment in Puerto Rico's grid reconstruction, according to people familiar with the agenda. Hosted by the Federal Emergency Management Agency, which is leading the Puerto Rico recovery, and DOE, the meeting also includes officials from Puerto Rico; representatives of the New York Power Authority; utility Consolidated Edison Inc.; the Southern States Energy Board, an interstate compact of governors and state legislators from 16 Southern states, Puerto Rico and the U.S. Virgin Islands; and the Rocky Mountain Institute, a clean energy think tank that has sponsored Caribbean energy projects. Congress remains the critical element in what happens to grid strengthening in Puerto Rico and the U.S. Virgin Islands, with pivotal decisions coming on new funds in supplemental appropriations bills, according to people involved in the process. The policy options before members of Congress could range from privatizing PREPA to federalizing it, including reconstituting PREPA as a power marketing authority. The one issue that appears checked off is that PREPA's current status as the commonwealth's monopoly power provider is going to end, sources said. Chris Shelton, the chief technology officer at AES, said that for microgrids to take hold on the island, the support of the federal government is essential. "You can't build capital assets like this, and you can't motivate the private sector to do that if you don't have a solid way to contract for it," he said. "Either FEMA participates directly in that process, or the federal government sets up some kind of more viable long-term structure to incentivize this type of investment."